But that is all in the rearview mirror now. As we all plunge deeper into the second half of 2018, the focus is on a potential slowdown in the wake of trade wars, higher labor and material prices, a moderation in the housing market, and the lagged impact of rate hikes. Will those factors be sufficient to give the Fed room to pause as central bankers approach their estimates of the neutral policy rate? At this juncture, it still looks likely that the Fed delivers rate hikes in September and December and probably into March of next year before they will entertain the notion of an extended pause. Their willingness to entertain that notion, however, will, of course, be data dependent. The July data begins to trickle in this week, starting yesterday with the ISM manufacturing report. The headline number slipped a notch from 60.2 to still strong 58.1. Considering the monthly volatility in the report, the takeaway is that manufacturing holds strong as the second half begins. The anecdotal comments in the report, however, are rife with concerns over tariffs. There is no guarantee these concerns dissipate quickly. While the conflict with Europe appears to be on the back burner for now, the Trump administration is reportedly poised to ratchet up the stakes with China. Manufacturers can only hope that calmer voices prevail. Disruption in manufacturing, however, may lead to only limited impacts on the rest of the economy. As we learned during the oil price collapse of 2015, a sector-specific shock is not necessarily an economy-wide shock. One place to look for an early warning signal is initial unemployment claims. Cases of tariff-related layoffs are emerging, but none seem significant enough to put much if any of a dent in the US economy. 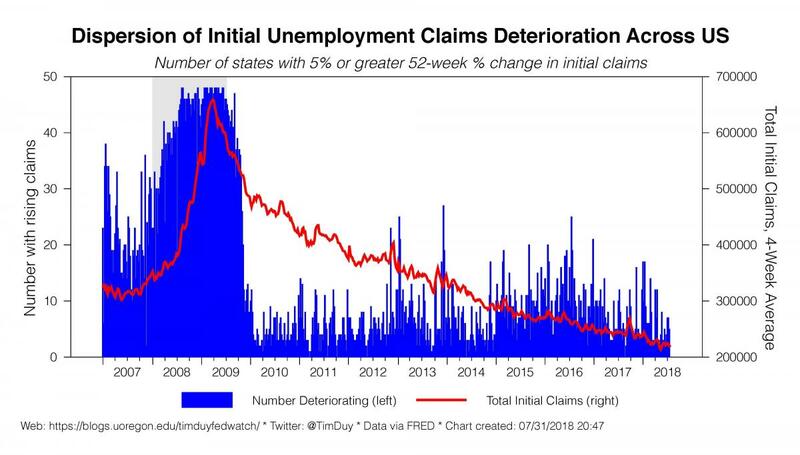 If the impact is great and spreading we should start to see a substantial increase in initial unemployment claims. So far, that has yet to happen; we will see another round of claims data this morning. There are some jitters that the housing market is slowing down. See this from Bloomberg and this from Calculated Risk. Given his track record, I would not bet against the more sanguine views from Calculated Risk. My take is that in many markets sellers became a little too aggressive on pricing given higher mortgage rates. The result was some pushback from buyers. That said, I don’t think the weakness in new home sales will persist. 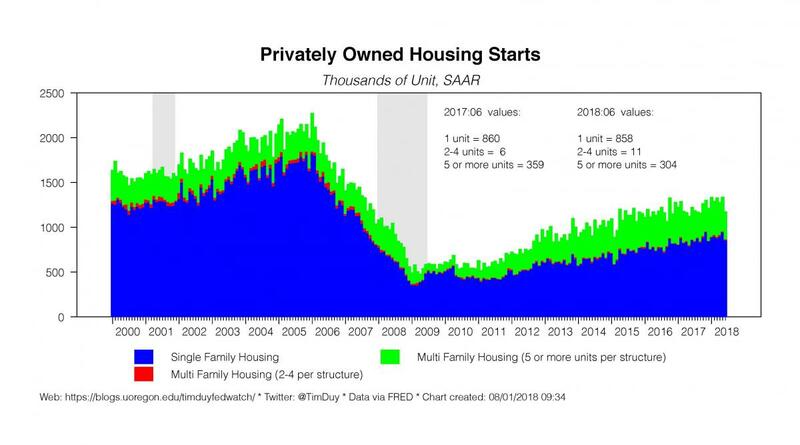 I suspect that the underlying fundamentals (solid job growth and demographic trends) will still push single-family starts steadily higher, but that multifamily has peaked for the cycle. The net result may be some softening in the aggregate numbers going forward, which would, in turn, weigh on economic growth. Still, you can imagine that the net impact of tariffs and manufacturing and housing and higher input prices, not to mention tighter monetary policy, all come together to materially slow the economy as 2019 approaches. This isn’t a recession warning, to be sure. Just a notice that although the economy retains substantial momentum, one can tell a reasonable story by which grow eases back enough to give the Fed room to pause in the early part of next year. Moreover, incoming wage and inflation data do not prevent the Fed from pausing if growth slows materially (likewise, they don’t give the Fed room to accelerate the pace of rate hikes). 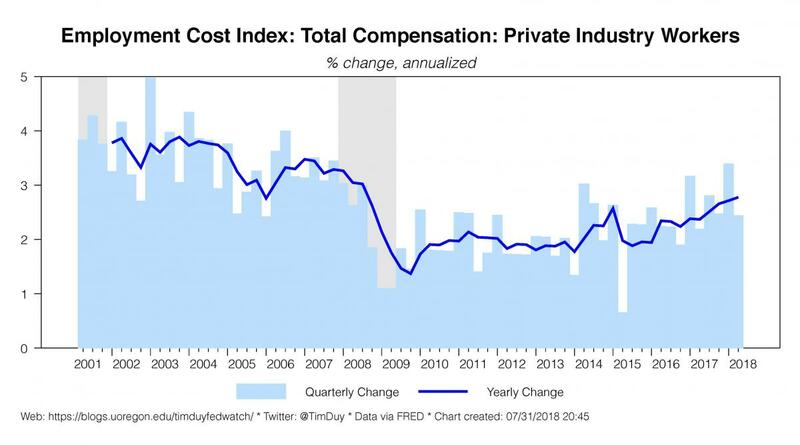 The employment costs index continues to make steady headway despite quarterly ups and downs but also remains at a level below that of recent cycles. In other words, nothing to suggest an overheating of activity is imminent. Similar story for inflation. 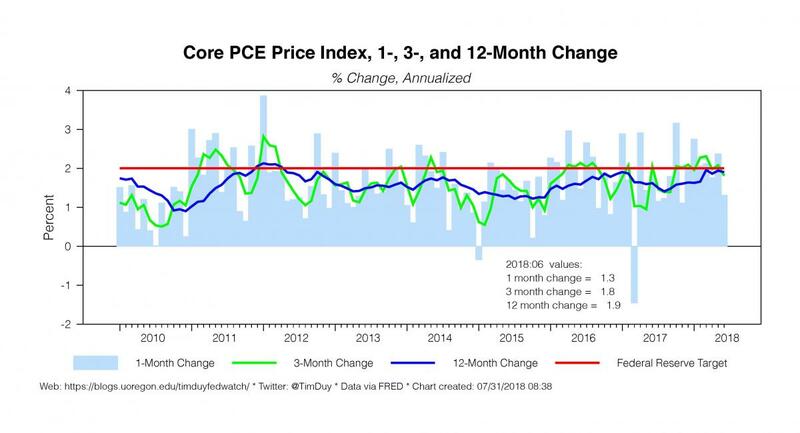 Core-PCE inflation, used by the Fed to monitor underlying inflation pressures, slowed in June to a 1.3% annualized rate and remains a notch below the Fed’s target on an annual basis. Talk of overshooting remains premature. To be sure, this slowdown that allows the Fed to pause is an almost perfect soft landing where growth eases back to a sustainable long-term pace before the economy overheats or the Fed pushes policy rates too high. That story is of course not yet in the data itself. 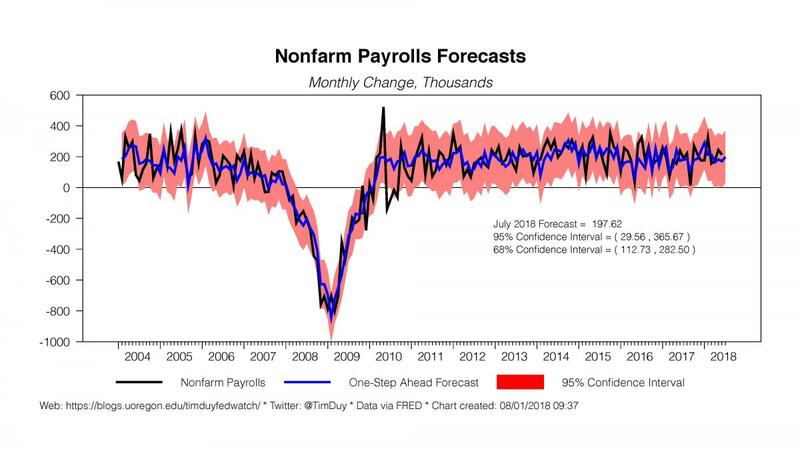 For example, Wall Street expects the July employment report will show job growth of 190k (close to my forecast of 198k), well above the 100k level the Fed anticipates needed to hold unemployment steady over time. I continue to find it hard to believe the Fed would be content to pause if job growth of this magnitude was expected to continue. In other words, until a slowdown emerges, the Fed will be hard-pressed to change course. Bottom Line: For now, the economy continues to grow at a pace that allows the Fed to stick with the path of gradual rate increases. Powell & Co. would like to see evidence that the economy is stabilizing at a more moderate pace of growth before entering into a period of extended pause. That evidence has not yet materialized, but we can tell a story in which it does materialize by the end of this year or early next year. Until it does, expect the Fed to keep the pressure on the breaks.